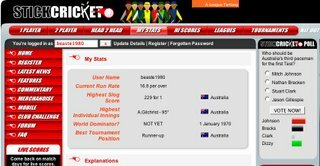 Some of you may have already seen this, however I was not aware of “stick cricket” until my cousin Mick posted it on his website. I also think these little web based games are great, and find them very challenging. Stick Cricket is not as easy as it looks, and takes a while to get use to. After playing quite a few matches, here is a screen shot of my stats. 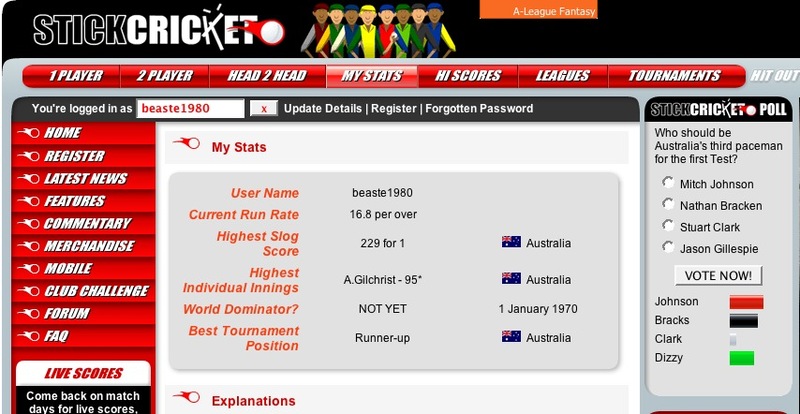 One of the best things about Stick Cricket is that you can register and then it will maintain your stats. If anyone else knows any other cool web based games please comment. Mick, I would be keen to play in a league, even though I am not quite sure how it works. I doubt I will be seeing much of the Ashes Sires from Germany, so this is a good way to keep my cricket skills up!